I am a big fan of things that feature math and are a bit light. And this TED talk is one of those things. it's in Spanish (with subtitles) but its filled with humour and the notion that if you want to give someone something forever, then forget diamonds, give them a theorem. Last week the Internet was all a buzz about Cheryl's Birthday. This week, not so much, but that doesn't mean we can't keep asking interesting questions. I like this one as it really shows the connection of two and three dimensional geometry. The premise is that you have a string wrapped around a cylinder and you are given the dimensions of the cylinder to determine the length of the string. There is no solution posted but I think the answer is interesting because of how you could use paper wrapped around a can to reveal the solution (that's all the hints I will give). 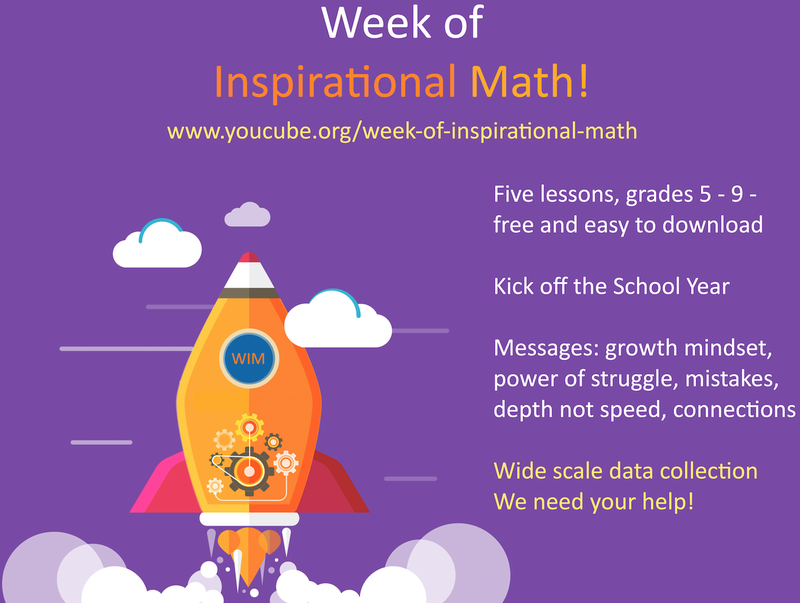 Some lessons to engage students with math and mindset are going to be available in May from Joe Boaler's YouCubed site. Follow the link below to register and get the grade 5-9 lessons for free starting in May. It's funny that I was just introduced to this algebra tiles app by someone and Jon Orr has a post about it. In fact, there is a whole suite of manipulative apps from the same developer, They are not free but they are very good. Although, I would rather have kids work with the physical things, sometimes using the app is better for some. 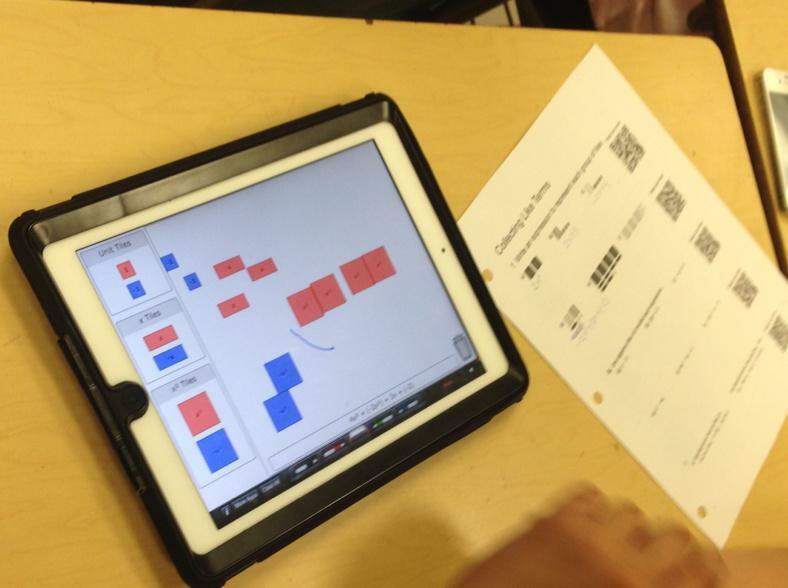 Here Jon, not only shows how to use the app but I like the idea of worksheets with answers available via QR codes. This is a nice idea and a nice little sorting activity. 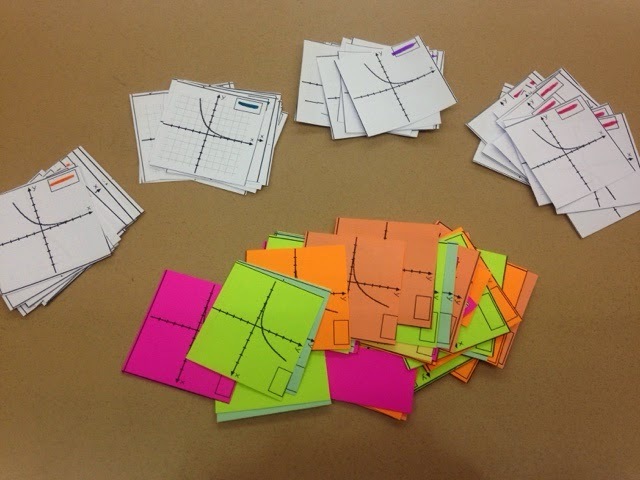 When we have multiple sets of the same activity (for groups) we copy each set on a different colour (like this set of Tarsia cards) so that it's easy to re-sort them if they get mixed up. Here is a post about doing the same thing but it uses a sorting activity for exponential functions as a download. I like this one from Kyle at Tap Into Teen Minds. It's a nice lesson that does a great job in conceptualizing multiplying monomials by monomials and binomials. There are a lot of good things about this lesson and even if you just like the idea of the consolidation video (below) then that's pretty good on it's own. It's sometimes hard to contextualize those questions that put the side lengths of rectangles as polynomials and I think this does a good job of it. See the whole lesson at the link below. Need to introduce the idea of correlation or linear relations? How about the Hot-Crazy index? And hey if you want to have some modelling data to connect Google searches to NHL ticket sales. Then look no further.